With the stubborn Flyers finally subdued and the Stanley Cup walked out to the Oilers at centre ice for the third time in four post-seasons amid a crush of media and fans, Wayne Gretzky hoisted the silverware skyward, then handed it off to sophomore defenseman Steve Smith. Smith, unwillingly thrust into the spotlight and emotionally shattered the previous spring when his pass attempt bounced off the left leg of Grant Fuhr and into the net against the Calgary Flames, ending a bid for a third straight championship by the Oilers, skated joyfully with the Cup in a moment of stunning redemption. With that one simple gesture, Gretzky, the greatest player to ever lace his skates in the NHL, provided one of those timeless, defining moments – one Smith, fans of the Oilers and this city will never, ever forget. Stu Kulak sent to NY Rangers to complete Ruotsalainen/Jackson trade (October 2, 1986). Moe Lemay traded by Vancouver for Raimo Summanen. Jeff Brubaker traded to Philadelphia for Dom Campedelli. Lee Fogolin traded to Buffalo with Mark Napier for Normand Lacombe, Wayne Van Dorp, and future considerations. Kent Nilsson traded by Minnesota for future considerations (2nd round draft pick – Link Gaetz (Minnesota)). Dave Semenko traded to Hartford for 3rd round pick (Trevor Sim). Stu Kulak traded by Vancouver for cash. Craig Muni acquired from Pittsburgh to complete McSorley/Meloche trade (September 12, 1985). Gord Sherven claimed on waivers by NY Rangers. Don Jackson traded to NY Rangers with Mike Golden, Miroslav Horava, and future considerations (Stu Kulak, March 10, 1987) for Clark Donatelli, Vile Kentala, Reijo Ruotsalainen, and Jim Wiemer. Danny Gare signed as free agent (formerly with Detroit). Tom McMurchy signed as free agent (formerly with Calgary). Dan Currie drafted 84th overall. Jim Ennis drafted 126th overall. Mike Greenlay drafted 189th overall. David Haas drafted 105th overall. Kim Issel drafted 21st overall. Ron Shudra drafted 63rd overall. The 1986-87 Oilers won 50-or-more games for the third time in franchise history. They amassed 100-or-more points for the sixth time and won the Smythe Division for the sixth straight season. Gretzky won his seventh scoring title with 183 points and his eighth Hart Trophy as MVP. This season wasn’t really about numbers, though. It was about redemption after seeing their bid for that third straight Cup denied with the stunning second-round loss to the hated Flames after a season in which the Oilers tied a franchise record with 119 points. They were everybody’s favorite to make it a three-peat. Based on how high the Oilers had set the bar in previous seasons, this edition of the team wasn’t as dominant as it had been. The Oilers had their string of seasons in which they’d scored at least 400 goals snapped at five. Gretzky, who had 200-or-more points in four of the previous five seasons, settled for 183. The Oilers won the Smythe Division, finishing 11 points ahead of the runner-up Flames after finishing 30 points ahead of Calgary in 1985-86. Still, there was a resilience to this team, and the Oilers would need it in a rematch of the 1985 Cup final against the Flyers. The Oilers rolled through the first three rounds of the 1987 playoffs with a 12-2 record, dispatching the Los Angeles Kings 4-1, the Winnipeg Jets 4-0 and the Detroit Red Wings 4-1, in the conference final. Waiting for them, the Flyers, who’d beaten them in two of three regular season meetings and were looking to avenge losing to the Oilers in five games in the 1985 final. Flyer goaltender Ron Hextall was as up for that as anybody as the Cup final series came down to a seventh game after Philadelphia battled back from a 3-1 series deficit with 4-3 and 3-2 wins. Hextall would win the Conn Smythe Trophy as playoff MVP after stopping 40 of 43 shots in Game 7, but the Oilers got what they came for. Jari Kurri got the winner and Glenn Anderson added insurance in a 3-1 decision to set-off the celebration. Gretzky, at his magnificent best with 34 points in 21 games to again lead the Oilers in playoff scoring, was never better than when he took his brief bow with the Cup in the bedlam, then handed it to Smith. Unforgettable. Remember when Esa Tikkanen was putting up points like a Hall of Famer for a few seasons? Where’s he going to fall in the Top 100 I wonder. Tikky’s a top-10 guy on my list. Totally agreed, Robin and I look forward to reading your profile on Tikk. 6 goals and 19 points in their run. Reijo Ruotsalainen also was a valuable addition that year from NYR/NJ. Don’t forget about Jaroslav Pouzar!!! Andy’s game 7 Cup clinching goal is a top 3 favorite!!! I cant believe Dave Semenko retired at age 30. After getting traded to the Whalers, he played one more pointless season in Toronto and that was it. Youd think he had some use somewhere in the league wouldnt you? He had a pretty tough go with Leaf’s coach John Brophy. That and some other things led to him moving onto the next chapter in his life. If you search you’ll get some more of the story. Semenko was a good Oiler and one of my favorite players. Question Can Yak go to The Bake Oma conditioning assignment without being waived? I remember the first period of Game 7 and the Oilers quickly were down two men when Messier and then Coffey took penalties. The Flyers got one goal on that power play, and then the Oilers took over (and never looked back). This season was also memorable in that it was the last one with the entire gang together. Game 7 was Paul Coffey’s last as an Oiler. That final series was some epic hockey. Was it the greatest type of hockey ever played? I can’t think of a better series. My favorite year for hockey 1987 Stanley Cup. 1987 Canada Cup. Epic. 2010 Olympics in Van was massive as well. …my favorite media moment from that series…True Story…Sparky Kulchisky grabbed me at the hotel one night off in Philly and we cabbed it down to the Spectrum where the Rocky Statue was at the front entrance…with a few ‘pops’ in us as usual he convinced the cabby and me to boost him up on top of the statue where he straddled ‘ol Sly and raised his arms yelling YOOOO Adrianne! while I shot a roll of film from all different angles…that’s when the cops pulled up cruising by…asked our intrepid locker room manager to come down and explain what he was doing…the cabby saved our a$$es saying we were just crazy Canadians down watching the series… assured the boys in blue he’d take us back to the hotel asap…pictures were great and Spark tipped well and bought the Philly Cheese Steak sandwiches at Gino’s Steaks that night! Great skill, lots of size and toughness, great coach and gm- the similarities between that team and this years team is SCARY – good! Merry Christmas RB. All the best to you and yours in the New Year! Hey Robin, where does Oates fall on the list?? @wodehouse holy #%÷€ that is awesome! 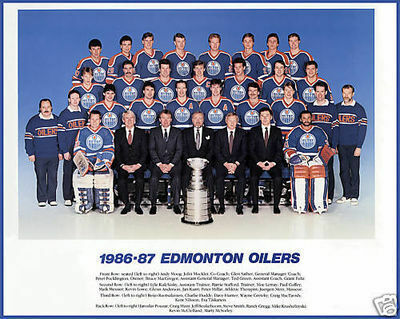 The oilers superstars of days long gone must be ashamed of the last ten dismal years…. Mr. Plywood commercials were never the same after Fogey and Sammy left town. Was a bummer day when Slats sent Fogey to Buffalo. He needed 6 games to get to his pension and really wanted to retire an Oiler. Not sure he ever really forgave the organization for that. Retired at the end of that season. Wasnt Brophy tryin to tell Semenko when to fight? Tapping him on the shoulder? Like Brophy thought he needed to tell Semenko how and when to do his job? I dont think so. I heard a radio interview with Semenko on the Sather Banner Night broadcast. Semenko alluded to you point about the tap on the shoulder issue. He said that was not the case in Edmonton but if it was, his career would have been significantly shorter. What you say about Brophy makes total sense. Off topic but i read an article about Nashville wanting some scoring. They need scoring and we need a dman. I do not want Weber and Josi is their #1 guy , so you’re not gonna get him. Jones is the guy. Can we get him without using Draisaitl as the key peice? I was at that game 7 final with my dad. Will never forget it as long as I live. – ANDERSON’S GOAL TO CLINCH: Bob Cole’s call of Anderson stepping over the blueline and letting loose a slapper that went five-hole on Hextall still echoes in my head. I was 14 at the time and I’m not sure if I’d heard too many other great calls by that point in my life. Here’s a tip, though: If you’re looking for the video on YouTube, be sure to get the one that includes Mark Messier’s almost-Herculean effort to almost score a goal about 15 seconds before Anderson scored. If you’re looking for 30 seconds of action that defined the Edmonton Oilers of the 1980s, that might be it. – THAT’S WHY WE OWE THE WINNIPEG JETS, BIG-TIME: I imagine it was maddening to be a Jets’ fan in the 1980s. Winnipeg had a bonafide superstar in Dale Hawerchuk, a star in Tomas Steen but otherwise had a whole bunch of guys named Smail, Boschman and Sykes, and zero goaltending. Not surprisingly, the Jets were up and down like a toilet seat in the 1980s – infamous for putting up a good season, then a bad season, then a good season, then a bad season and so on. But, for three straight seasons in the mid-1980s, the Jets met the Flames in the Smythe Division playoffs and, on two occasions, they beat Calgary and then bowed out meekly to the Oilers in the next round. The 1986-87 playoffs, thank goodness, were one of those seasons. – THE OILERS WERE UNIVERSALLY DESPISED IN CANADA: Nowadays, hockey fans in Canada will almost reflexively cheer for “whatever-Canadian-team” is in the playoffs, regardless of where they’re from. That’s probably a product of the fact that a Canadian team hasn’t won the Cup since 1993, or maybe simply because there are so many U.S. teams in the league. Regardless – it’s a huge change from the 1980s, when it wonderfully regional and petty and tribal in among Canada’s NHL teams. No one – and I do mean NO ONE – flew another Canadian team’s flag on their car just because they happened to make it to the third round. And nobody outside of northern Alberta was flying Oiler flags. That came to light during an intermission piece that Hockey Night in Canada did during Game 7. As was their practice, the MotherCorp set up cameras in sports bars across Canada to get the “truly Canadian perspective” on what was the first seven-game final in a while. Reporters interviewed bar patrons in places like Vancouver, Toronto, Hamilton, Winnipeg, St. John’s, etc. When asked who they were pulling for, no one – and I do mean, NO ONE – said they were rooting for the Oilers. They even managed to find a few knuckle-dragging meatheads who grunted that they’d been Flyer fans since the 1970s. It was hilarious … and a little eye-opening, especially if you were a naïve, teenaged Oilers fan growing up in northern Alberta. I mean, how could you not love the Oilers? – THE DRESSING ROOM INTERVIEW WITH COFFEY: I don’t remember who from CBC was doing the interview (Cuthbert maybe?) … but it wasn’t good. Coffey and Glen Sather had feuded publicly all season (and most of the decade, actually) but it was hoped that they could clear things up over the summer. However, in an interview amid the dressing room celebrations, Coffey expressed doubts that he’d be coming back to Edmonton that fall unless things were addressed. They weren’t … and… after sitting out training camp and the first few weeks of the next season, he was banished to Pittsburgh. None of us knew it at the time, but that dressing room interview foreshadowed what would become an exodus over the next four years. – IT WAS THE LATEST FINAL, EVER. Nowadays, the Cup final will often run into mid-June. Back then, however, if things weren’t done by mid-May, it was weird. With the 1987 final, Game 7 was on May 31, the latest-date ever for a Cup final game. It felt more like summer than spring. – “HACK-STALL! HACK-STALL!”… N’uff said. I got in fist fights during this playoff (grade 7, you could do that back then and it didn’t ruin your life) almost every day over Gretzky vs Hextall. In the end it was a foregone conclusion, wasn’t it? Sure was a good final though! I was growing up on the West Coast and to echo Spaceman Spiff there were a LOT of Flyers fans in my school that year.